Announcing the launch of the APSP's revamped website: Apspuhuru.org! 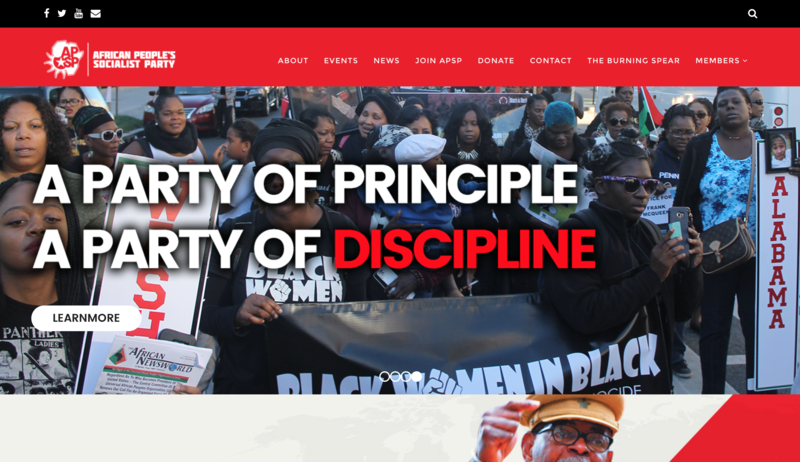 The African People’s Socialist Party (APSP) is pleased to announce the launch of our newly updated website on December 19, 2016 after over a month of hard work and dedication! Our new site can be found at this URL: Apspuhuru.org. This has been a long time coming and is a victory in the struggle for freedom for African people! Our new website provides our people with an easy yet comprehensive way to learn about the work of our Party. Apspuhuru.org puts our revolutionary Party front and center! We've created a simple menu and navigation that makes sense. Our new website is interactive and gives abbreviated and detailed information with our “About Us” section, which consists of: Party leaders, History, Platform, Program, African Internationalism, African Socialist International, Uhuru Movement, Black Star Industries and FAQs. We also have sections for Party news as well as our upcoming events and a Join APSP page. Through this website, we will keep you updated with the Party of the African working class. So head on over Apspuhuru.org! We are certain that you will find our newly updated website with a fresh look and easy to access information. We would like to give a big “Uhuru!” to our powerful forces who struggled tirelessly to create a powerful website to match our powerful Party!